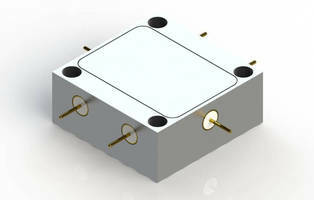 Middletown, Ohio – NuWaves Engineering, a veteran-owned small business providing advanced radio frequency (RF) and microwave solutions, today announced a Small Business Innovation Research (SBIR) Phase I contract from NASA to research and develop a high-efficiency Ku- or Ka-band RF power amplifier (PA) monolithic microwave integrated circuit (MMIC) device for over-the-horizon (OTH) command and control (C2) data communications with Unmanned Aircraft Systems (UAS). The goal of the research project, named HYPERION, is to design and develop a high-efficiency (≥50%) PA MMIC for incorporation into UAS C2 satellite communications (SATCOM) data links, which augment traditional line-of-sight communications. For instance, future commercial UAS operations call for transoceanic flights which would require an OTH communications capability. The PA MMIC will incorporate a Doherty amplifier to maintain power efficiency over a wide range of RF input levels. This wide dynamic range can support a number of different waveforms, from constant-envelope waveforms, such as frequency shift keying (FSK) and binary phase shift keying (BPSK), to more complex waveforms, such as quadrature amplitude modulation (QAM). The HYPERION PA is expected to deliver saturated power (Psat) of approximately 25 Watts and at least 18 dB of small signal gain. NuWaves Engineering is a premier supplier of RF and Microwave solutions for Department of Defense (DoD), government and industrial customers. An RF engineering powerhouse, NuWaves offers a broad range of design and engineering services related to the development and sustainment of key communications, telemetry and electronic warfare systems, as well as a complete line of commercially available RF products. NuWaves’ products include wideband frequency converters, high-efficiency and miniature solid-state power amplifiers and bidirectional amplifiers, high intercept low noise amplifiers and miniature RF filters. NuWaves Engineering…Trusted RF Solutions™. Contact Ryan Canning, Director of Business Development, Engineering Services, at 513-360-0800, or visit www.nuwaves.com for more information.